Here are some examples of how to use this cool Twitter tool. 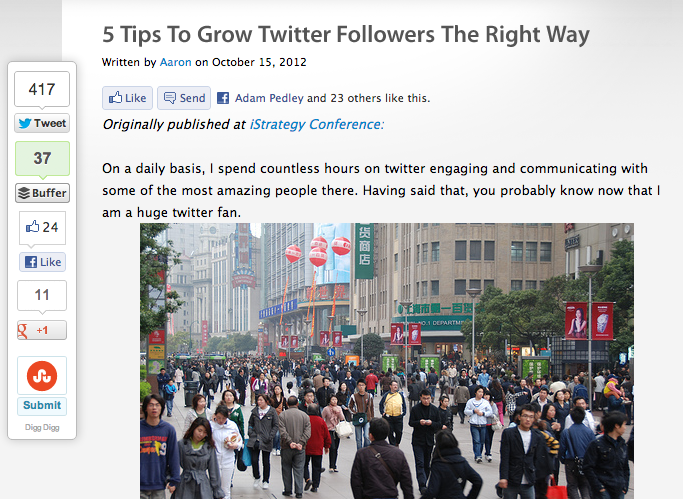 When you start to build a community, you’ll want to make sure you follow the right people. 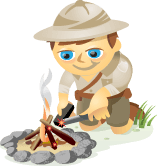 SocialBro helps you find your target audience through a function called Discover Twitter Users. This feature works with filters and search options to give you the data you need to find your relevant audience. SocialBro's filters allow you to find your relevant target demographic. You can filter your search based on time zone, language, verified/non-verified users, public/private profiles, profiles with or without URL and profiles with or without customized avatar. After that, you can arrange the searches by doing a second filter based on influencer score, followers, number of followers, following, lists they are in, followers/friends ratio and more. 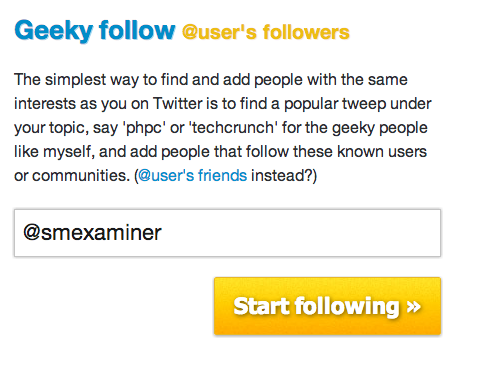 This helps narrow your search results to find relevant Twitter users to follow. And this is beneficial as you can often create a more dynamic community when you use more specific targeting. You’ll want to use these results to create lists to keep track of the people you’re interested in. For example, you can create Twitter lists for clients, influencers, industry thought leaders and competitors to follow their conversations easily. Another way to find relevant followers is to use the Monitor a Hashtag feature. It’s a great way to keep tabs on people relevant to your business and follow their conversations on Twitter. Here’s an example of a search on #blogchat, a Twitter community that actively discusses topics on blogging every week. When you monitor hashtags, you can find relevant Twitter users who use them. With the Monitor a Hashtag feature, you’re able to see who has used the hashtag, users who have followed you, users who have not followed you and users whom you’re following and aren’t following you back. You can choose to engage with the people who aren’t following you. And when you get to know them, they’re more likely to follow you back. This is a great way to build your Twitter community with people who share similar interests. Twitter is all about social commentary, so listen to conversations to define the community your business needs on Twitter. Keep an eye on a competitor’s Twitter account and compare it with yours. 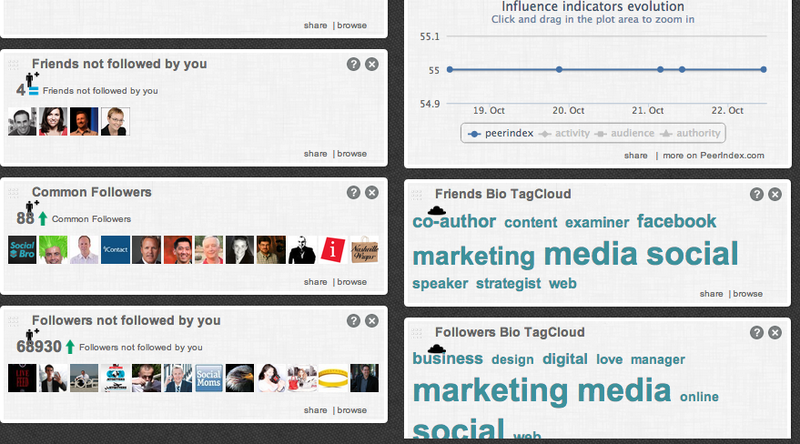 Analyze its evolution to see who they recently followed, common followers, who you have not followed and more. Keep up with their social media strategy and it may highlight areas where you could modify your strategy. Your business most likely targets the same audience as your competitors. With SocialBro, you’re able to use the filters mentioned above to zoom into your competitors’ followers, quickly analyze their followers and determine whether they’re relevant to your community. You can decide to follow your competitors’ followers or simply create a Twitter list of their followers and engage with them in the future. It’s important to maximize your time on Twitter. SocialBro has a feature that lets you know when your followers are online and find the optimal times to engage with them. Best time to tweet based on SocialBro's analysis. SocialBro is a great tool to help you engage with your community. It gives you the ability to search both within your community and throughout the entire Twitter platform using a variety of search criteria. Another benefit of using SocialBro is that it can be integrated with Buffer, the next tool I discuss. Other alternatives to SocialBro for Twitter management are SocialEngage, Sprout Social, HootSuite and TweetDeck. In addition to a Twitter management tool, every business needs a scheduling tool. Although many Twitter management tools come with scheduling features, none of them can compare with one of the simplest Twitter scheduling tools available, Buffer. Buffer makes it easy to schedule your tweets. All you have to do is pre-set the date and time of your posting schedule ONCE and you’re done. You’re able to space out your tweets to avoid spamming your followers. Schedule the times you'd like to tweet in your Buffer dashboard. Need to figure out the best time to schedule your tweets on Buffer? I recommend you use Tweriod or SocialBro for this. Once you’ve set your timing, the hard work is done. To add a post or a tweet to your account is simple—you can either use their Google Chrome extension, their iPhone app or even the Buffer share button installed on many sites. When a website has a Buffer button, just click it and you've buffered a post. After you find an article to share and click on the Buffer button, a pop-up like the one below appears. You can either use the same text or change the text you want to tweet and click the green Add to Buffer button and you're done. All you have to do is select the account you want to use, change the text if you want to and click Add to Buffer. You’re done! 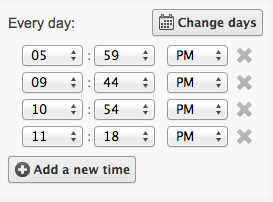 Your Buffer is now set to tweet based on the times you set earlier. Buffer also offers analytics to find out if you’re getting the best out of your tweets. Analytics from Buffer showing you how your tweet performs. You can get statistics based on the number of clicks, retweets, mentions and favorites all from their website or on their iPhone app. Tip: It increases your visibility to thank people for their retweets. Even if you have little time to do this, try to thank those with a large number of followers. It’s easy to do this from Buffer’s website. With Buffer’s free account, you can have one Twitter, Facebook and LinkedIn account and schedule a maximum of 10 posts per day. If your business has an active community, you may need to upgrade to the paid pro plan to schedule more than 10 posts per day. Buffer is a great tool for small business owners who want to optimize their tweets and save time. And Buffer has partnered with many other tools such as SocialBro to improve your social media marketing experience. Tweepi is a great additional tool for small businesses. You can use Tweepi to manage and grow your Twitter followers. Tweepi is quite straightforward. 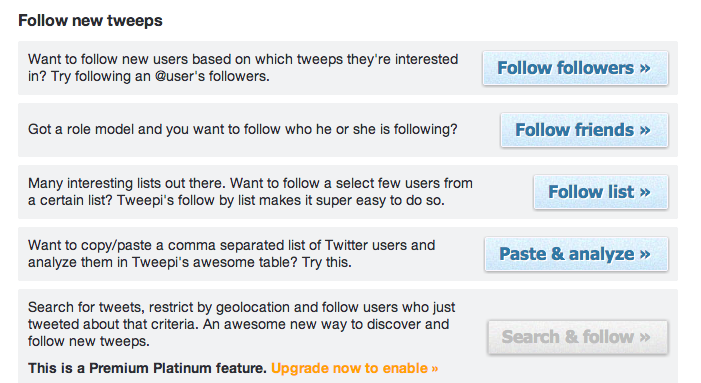 It allows you to unfollow inactive users, add new followers and easily follow back the people following you on Twitter. 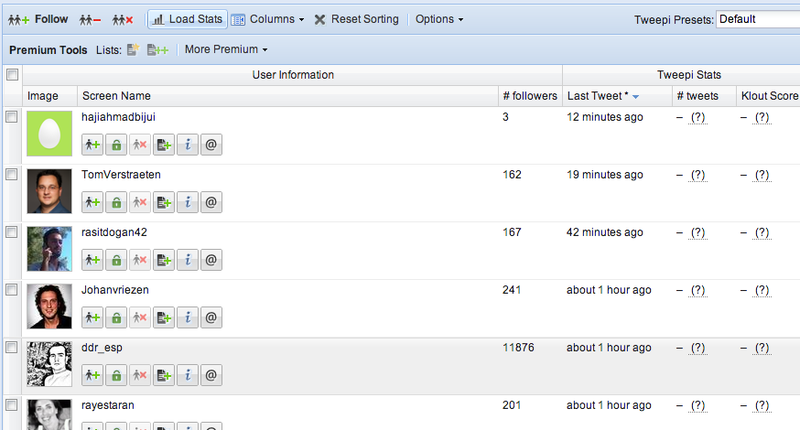 You can sort Twitter users based on followers, tweets, last tweet and Klout score. This information is presented in an easy-to-read format. It’s easy to identify inactive followers and unfollow them. This is important to keep your Twitter community relevant to your goals. Tweepi helps you manage your followers. One of the features that I like to use is the Follow Followers function. As the name suggests, you can easily follow the followers of any account you choose. For example, this means you can follow the people who are following your competitors on Twitter. All you have to do is insert the Twitter account you wish to follow. You can choose the Twitter account for any of your competitors, influential users or highly active accounts. Then simply click Start Following. The Follow Followers feature allows you to follow users who are following any Twitter account. Next, Tweepi gives you a list of 20 users who recently followed the account and you can choose from there. This list shows the most recent followers. I like to sort the results on this list by Last Tweet and follow those who have a real photo of a person in their profile. You’ll want to be careful to avoid following businesses that use Twitter for the sole purpose of promoting their products. Once you’ve selected the people you want to follow, simply click Follow and you’re done. Tip: Follow a small number of people. I suggest you follow fewer than 100 per hour and never more than 500 in a day. Tweepi applies Twitter’s rules of only considering a certain number of follows at a time as legitimate. If the number of people you follow is too high, you’ll be considered a spammer. So you’ll want to use this tool wisely and with moderation to get the most out of building the community you want on Twitter. 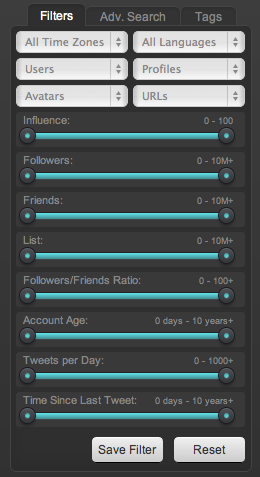 Another alternative to manage your Twitter community is ManageFlitter. There are many useful Twitter tools, but these three are a great place to start your Twitter marketing. As you move forward, choose additional tools that best fit your social media goals. What do you think? Are these all the tools you need? Are there any other tools that you would like include? Join the conversation below and let me hear your thoughts.